Paige Smith and Jayla Alexander sit in the team's dragster before going around the square of Bruce. 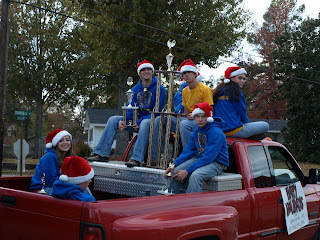 A quick pose before the parade! The Houston Christmas Parade was Saturday, December 1. 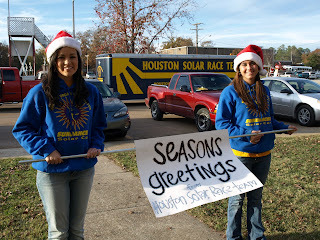 The Houston Solar Race Team, along with many other entrees, paraded around the square of Houston. 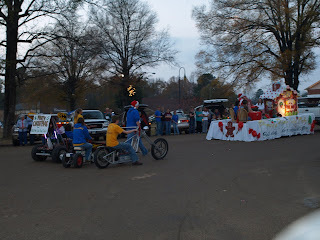 The parade started at four o'clock P.M. The sight of our trailor excited many of the onlooking citizens. They clapped continuously at all of our accomplishments. 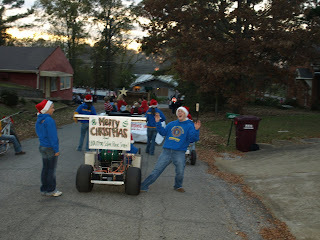 Although the weather was warm, the streets were still filled with the Christmas spirit! 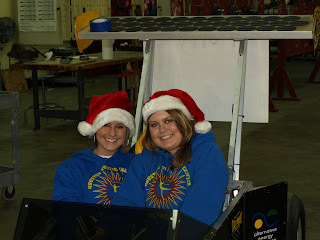 Amber Patch and Alisha Holder sit in the dragster waiting to line up for the parade. Ramona Booth and Jeri-Laken Alexander prepare to lead the team around the square of Houston. Waiting for the parade to begin. We had a few minutes to play around while we were waiting! 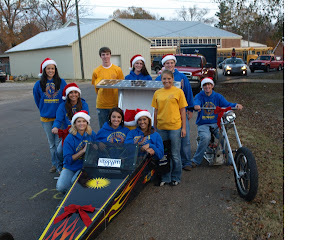 Mrs. Anita Ellison, Mrs. Donna Turman, and Mr. Keith Reese made a trip to Jackson on Wednesday, November 28 to display the solar car for Mississippi Technology Alliance. These three centers facilitate our mission to help entrepreneurs, manufacturers, communities and investors create Mississippi companies. Mrs. Donna Turman and Mrs. Anita Ellison with the car on display. We greatly appreciate their support, and look forward to working with them in the future! Chuck and Diana Hall have taken on an amazing project! They have collaborated with us for help and guidance throughout their project. The Hall's currently reside in Texas and are both alumni of Purdue University. They have been judges for the Dell-Winston Race that takes place or starts in Dallas, TX every year since 1996. The idea for the project was discussed this past summer with Mr. Reese when General Hall was the judge for our team one day. Mr. Reese was enthused by the idea, and immediately was interested. 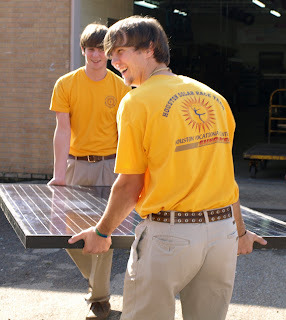 He granted the Hall's access to the lab at our school and the use of some of our solar cells. After the boat's completion, it will be stored in the lab for safe keeping. It's always a great feeling to help someone who is helping our environment! 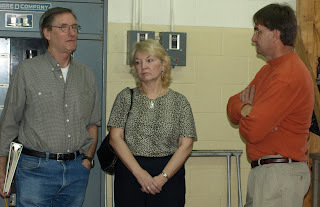 Chuck and Diana Hall with Mr. Reese discussing plans for the project. 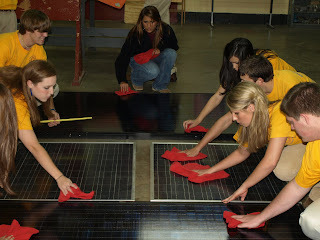 Some of the members of the team cleaning off the solar cells that are being used on the Solar Wind. Exploring the different possibilities for the arrangements of the solar cells on the Solar Wind. 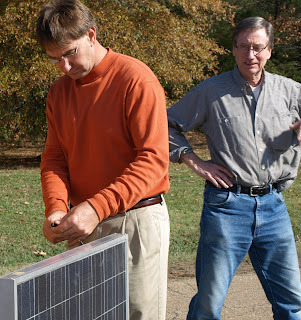 Will Turman and Jonathon Barnett of the team bring out the solar cells so that we can meter them correctly. 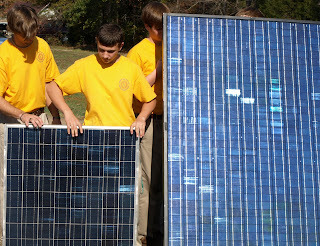 An important element to check the correct efficiency is putting them in the Sun! 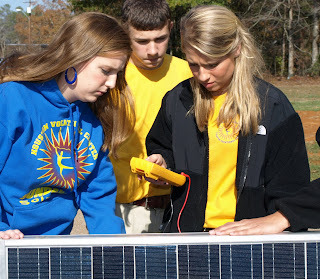 Preparing to meter the solar cells. 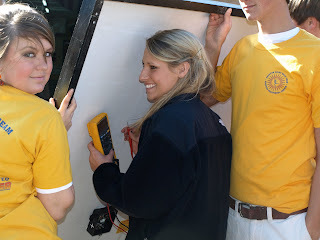 Reading the metering of the solar cells. 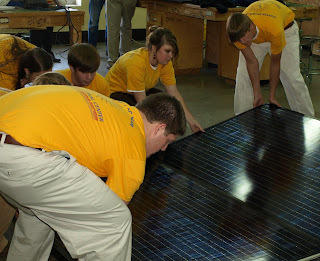 Mr. Reese metering a panel. The team with Chuck and Diana Hall.